"For more than 40 years, DECLÉOR continues to lead with its visionary approach to beauty, as the trusted expert and innovator in aromatherapy skincare. Combining nature’s purest and most potent active ingredients, DECLÉOR scientifically selects and masterfully blends premium essential oils to deliver for each skin need, targeted and proven skincare solutions. Understanding that beauty and well-being are intrinsically linked, DECLÉOR offers a unique sensorial experience that visibly enhances the skin’s natural health and radiance." Decleor Aromessence Neroli Serum is a comforting concentrate that has been formulated for all skin types to help perfect the skin and keep it hydrated and radiant. 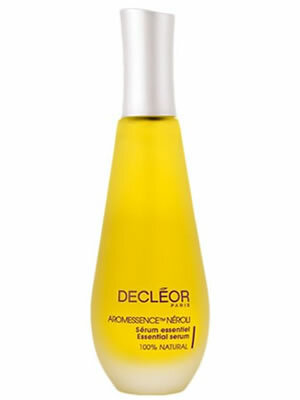 Decleor Aromessence Neroil Oil is formulated with an elixir of 100% pure and natural essential oils and combines oils that are specially to comfort the skin and relieve it of any signs of daily stress. Decleor Neroil Face Oil aims to increase its effectiveness by immediately penetrating the skin and soothe and relax the whole area, for a sensation of immediate comfort and radiance. Decleor uses a combination of sandalwood, neroli, petitgrain, sage, parsley and juniper berries to help the Neroli Oil achieve these results.